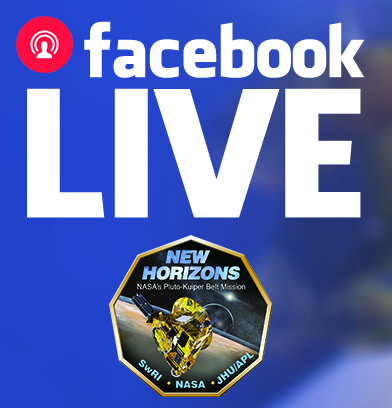 Members of NASA's New Horizons team will discuss the achievements of the first encounter with Pluto and look ahead to the mission's next exploration of the Kuiper Belt during a Facebook Live event at 4 p.m. EST on Thursday, Jan. 19 -- the 11th anniversary of the spacecraft's launch. The conversation will cover a range of topics, including the top three findings from the spacecraft's Pluto flyby and what New Horizons is doing on the way to its next science target. The team will answer questions from the public during the live event. Media may submit questions before and during the event by emailing Laurie Cantillo at NASA Headquarters, laura.l.cantillo@nasa.gov. New Horizons team members also will be available for interviews through Friday, Jan. 20. Media should contact Michael Buckley in APL Public Affairs at michael.buckley@jhuapl.edu to arrange interviews with the team. All data from New Horizons' flight through the Pluto system in July 2015 has been transmitted safely to Earth, with the last bits arriving last fall. While the team continues to analyze this historic set of images and other materials, it's planning for the spacecraft's next encounter – a flyby of Kuiper Belt object 2014 MU69, on Jan. 1, 2019.